A team of researchers from the Korea Advanced Institute of Science and Technology (KAIST) has, using advanced nanotechnology, developed a cardiac pacemaker that gives new meaning to the phrase "batteries not included." According to researchers, the number of patients receiving pacemakers each year is well into the millions and growing, indicating imminent need for a self-powered unit. In conventional units, batteries need to be changed every seven years, exposing patients -- most of whom are elderly -- to the risks of heart surgery. "For clinical purposes, the current achievement will benefit the development of self-powered cardiac pacemakers as well as prevent heart attacks via the real-time diagnosis of heart arrhythmia," says Professor Keon Jae Lee of the Department of Materials Science and Engineering at KAIST. Dubbed a "flexible piezoelectric nanogenerator," researchers implanted the semi-permanent unit in a laboratory rat. The unit works by harvesting electrical energy from the patient's minute body movements to stimulate the heart. Dr. Lee is encouraged by the unit's success in the laboratory and believes the invention will be useful for other implanted medical devices. 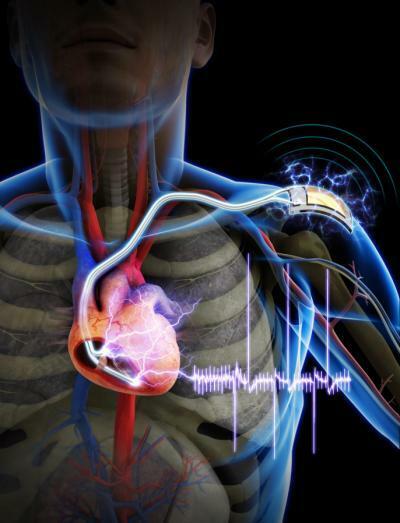 This advancement comes not long after researchers at Stanford University discovered a method for wireless power transfer to deep tissue micro-implants, including pacemakers. The Stanford unit can either be powered wirelessly or recharged using a credit card-sized unit that transfers charge through the body. The devices from the two studies in question have yet to be tested on humans.